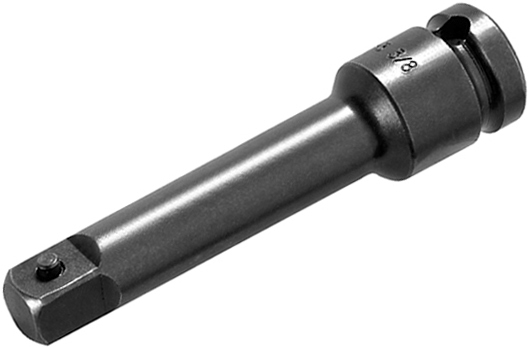 Apex 1/2'' female square drive to 1/2'' male square drive extensions from Apex Fastener Tools formally Cooper Tools. Drive extensions form Apex Fastener Tools feature durable construction and a quality design that ensures a long service life. With Apex drive extensions you are assured of high quality and industrial strength. Drive extensions from Apex Fastener Tools have hex tolerances that are on average 48% tighter than DIN and 35% tighter than ANSI requirements. With Apex Fastener Tools, the industry leader in drive extensions, you are assured of an exact, sure fit. All Apex drive extensions have the tightest tolerances for straightness and concentricity in the industry. High strength fasteners in demanding situations, like those found in the automotive and aviation industries, often require the use of an impact wrench or impact driver to deliver the amount of torque required to tighten or loosen them. 1/2'' Apex brand square drive extension with pin lock, overall length 7''. 1/2'' Apex brand square drive extension with pin lock, overall length 24''. 1/2'' Apex brand square drive extension with pin lock, overall length 28''. The EX-508-B-5 1/2'' Apex Brand Square Drive Extension is one of thousands of quality tooling products available from MRO Tools. Please browse Apex 1/2'' Square Drive Extensions for tools similar to the EX-508-B-5 1/2'' Apex Brand Square Drive Extension. EX-508-B-5 1/2'' Apex Brand Square Drive Extension description summary: Apex brand 1/2'' female square drive to 1/2'' male square drive extensions. Male Square: 1/2'' Type Of Lock: Ball Overall Length(in. ): 5'' Overall Length(mm): 127mm Quantity discounts may be available for the EX-508-B-5 1/2'' Apex Brand Square Drive Extension. Please contact MRO Tools for details.